In addition to Orthophotography and LiDAR, all four of the pre-qualified contractors of the state’s Photogrammetric Services contract also offer oblique imagery, mobile/corridor LiDAR. Since these items are not included in the state contract, if you are interested in these products, please contact the vendors. 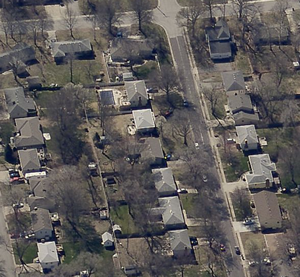 Oblique imagery is aerial photography that is captured at approximately a 45 degree angle with the ground. The angle which is inherent to oblique imagery allows viewers to see and measure not only the top of objects but the sides as well. Oblique Imagery more closely resembles how people normally view their landscape compared to traditional orthagonal (straight down) imagery. One of the hottest topics in the LiDAR industry at present is mobile mapping: dynamic terrestrial LiDAR, often combined with simultaneous oblique, stereo image capture. Collection of very high resolution, high accuracy street-level views of urban infrastructure captured from the ground or low flying helicopter platform, capturing vast quantities of LiDAR point cloud data in a relatively short amount of time. A terrestrial LiDAR system is able to see between buildings and under tree canopy in ways that airborne LiDAR, regardless of point density, will never be able to. 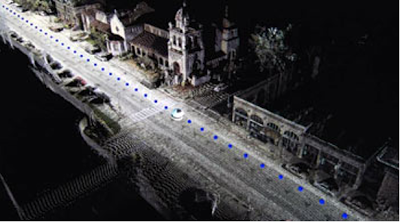 Mobile mapping systems generally collect a full 360-degree field of view at a speed of 15-20 miles per hour. This highly precise data can be used to create realistic streetscapes for corridor road and utility engineering projects and roadway asset and infrastructure mapping.